While the concept of an automated home was conceived many years ago, various technical limitations have, until recently, meant that a truly connected home was but a dream for the average consumer. With the advent of mass-deployed broadband Internet access and the development of wireless technology, smart connected devices in the home are now a very real possibility. 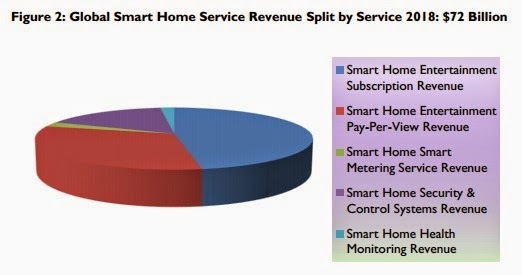 Juniper Research forecasts that the installed base of connected appliances in Smart Homes will exceed the 10 million mark by 2017 -- that's rising from 4 million units in 2013. Their latest global market study found that consumer awareness of connected appliances -- such as smart refrigerators and washing machines -- was gradually increasing, but that such devices are not widely considered to offer attractive value-added benefits. According to the Juniper assessment, smart appliances remain a niche item, given their high retail prices, poor use cases and ongoing security concerns. While the technology to leverage the Internet of Things (IoT) devices is already available, no Internet service provider has yet made a system for intelligent automation services available to consumers. Juniper observed that consumer electronics (CE) manufacturers -- such as Samsung and LG -- are pushing ahead with their range of intelligent appliances, as part of their wider Smart Home strategies. Samsung is the first major CE manufacturer to demonstrate an entire ecosystem of home appliances and technologies over its Smart Home Service platform. However, this service only functions with Samsung products, which will very likely stunt the growth opportunity, and discourage brand-agnostic consumer buyers that wish to mix-and-match appliances for their unique needs and requirements. Deploying Smart Home services in the cloud will reduce the need for expensive Smart Home device processors, and allow these devices to benefit from the power of Big Data. Service providers should encourage a user community to help diversify Smart Home application possibilities to cater for individual needs.